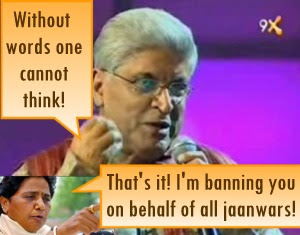 As a lyricist I enjoy Javed Akhtar's concoctions, well mostly (Meena thinks he is a Lyrics Factory). His ability to thread together interesting words on even a potboiler like OSO made me sit up and pay some attention. Although I'm not much of a consumer of poetry, his prose almost always is of interest to me. In interviews, he's engaging and full of fascinating anecdotes which he unfolds carefully like treasured possessions - he's the kind of person you would like to invite over for dinner. But of course there is a different Javed Akhtar as well - the one who pops up on shows almost always as an evaluator of proceedings. I've watched Javed Akhtar on enough shows that I can tell you that his presence fills me with mixed emotions. His presence is a dignified one, until you realize he has very little patience for those he marks down on perceived intellect. His pride in Hindi and Urdu are rousing, until he carries on incessantly in it, often making the same point repeatedly. His intellect is refreshing and so is his sense of soulful observation, until he tries to say something clever every time he is handed the mike. No one is without flaws - or as in my case overwhelmingly filled with them (but then, I'm not on TV). And watching anyone incessantly can take away the mystique. And I believe this might be happening with Javed Akhtar. There is a filmi template of overexposure that is prevalent in Bollywood where stars blanket themselves on hoardings, media, TV and films. But while this might work with their core audience - which is considerably younger than Javedbhai's - it certainly doesn't do the poet any favors. Limit your appearances on TV - show up as a celebrity guest or trade in some favors for an occasional appearance instead of doing an entire season. Once in a while walk in with Shabana Azmi to help promote her movie. Definitely keep the bagalthela look, but mix in those Khadi Bhandar kurtas with some of the more colorful ones you wore on Indian Idol 3. And above all remember that intellect comes in many forms. Very well said Aspi.I guess its difficult for everyone to be on their best behaviour and wittiest all the time. So I think ur not-at-all-phaltu-advice applies to all the stars. Aspi, bang on with the 'treasured anecdotes' comment. Wow, the drift site has been busy with posts. The whole Javedji as the ultimate linguist in stark kurti's is getting boring. My advice to JavedJi would be to show his romantic side. Maybe write a poem on Shabana, talk about his crushes in his younger days, regale us with inside stories about bollywood/salim-javed days, talk about his kids.